Now consider the ‘extents’ of each 3 note group, i.e the lowest and highest notes (or vice versa) or the notes at the ‘extent’ of the 3 note span. Here I’ve got them as an ascending run (AA) and a descending run (DA). …and finally here’s a run that mixes the extents and the original notes. Considering a minor ii V I such as Dmin7b5 | G7 | Cmin, a melodic minor (in this case F) gives a nice flavour. I got it from here – Jack Zucker (who hangs at The Gear Page a lot). I spent about 20 mins jamming over this. I call these ‘Atoms’ – let’s skip by why I call them that for now (I plan a deep dive on Atoms for the future) and look at some of their properties and application. In the four cases above (and let’s imagine that these are all on the low E string) two of them go up, and two of them go down. The first two go up, i.e. the last note is higher than the first note (regardless of what note is in-between) and I call these ASCENDING (A) ATOMS. Numbers 3 and 4 go down, i.e. the last note is lower than the first note; I call these DESCENDING (D) ATOMS. I’m trying to apply an approach to an aspect of my improvisation (mainly longer runs) that uses combinations of these to instill some variety within lines. This is an Ascending Descending [AD] line. What’s so great about these? Well, there is an infinite number of combinations/permutations of atoms and their intermixing which pull you away from straight ‘AA’ or ‘DD’ all the time. I can plan my line in my head as ‘ok – I went to get from up here to down here’ and I can go there by ascending or descending ‘atomically’ as it were. …which Dave Navarro later describes as ‘that is f*cking the sh*t man!’. And it is. I don’t know about you other guitar players, but I feel constantly compelled to work on my technique and to learn fast flashy stuff that will impress the pants (or knickers) off people. 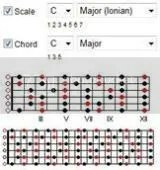 So while I should be diligently learning the Cycle of 5ths (and 4ths) or mapping out the arpeggios of G7 or analyzing the notes of the 7th mode of the ascending Melodic Minor (the Super Locrian/Altered Scale) against the root of the current chord in the name of trying to learn to be musical, instead, I get easily distracted by yet another article on How to Shred (even though I can already shred) or how to do some outlandish tapping exercise, an example of which I succumbed to this week. You see, flippin’ Guitar Techniques magazine is too frickin’ awesome. And its contributors are too frickin’ awesome. I bought last month’s issue (“Acoustic Issue!”) because I had dusted off my Baby Taylor, grown my fingernails a little and wanted to get down some Beatles fingerpickin’ licks. Instead, I’m confronted by an article by the superb (and now clean shaven) Martin Goulding on doing two-handed tapping ala Nuno Bettencourt on He-Man Woman Hater (Pornograffiti). Anyway, I spent about an hour with a metronome practicing these licks and aside from some muting flubs where I can’t get the 3rd string to stop ringing (or I mute it too hard and too early resulting in a muffled note) and by the end of the practice session was getting prettttyyy good at it. I cheated though and tied a cloth round the neck to stop notes ringing. Anyway, here’s a C major 7 that I ended up practicing. I think the notes are right, but I’m away from my guitar right now. The key new technique for me is the left hand tapping, i.e. ‘hammering on from nowhere’ as we ascend to start up each string ringing. Slurs are not indicated, but obviously, there’s no picking – it’s all hammers, taps and pulls. Beatles licks have still not yet been attempted as Shredding trumps Beatles fingerpicky parts any day in my book. I’m the proud owner of an Yngwie Malmsteen Signature guitar cable, plus some other normal DiMarzio cables. I love them. I like the cloth braid instead of some nasty rubbber. Yes – I’m shallow – I’ll buy virtually anything with Yngwie’s name on it except the dumb DOD overdrive which I bet he doesn’t even use. Anyway, being a fan of DiMarzio cables I went to the site to see what they had that I could get to connect some stuff to my Boogie’s effect loop. Under the instruments section, I noticed that John5 has a new sig cable; cool. But Yngwie’s was no longer there. Further, he’s not under the Featured Players list (despite being the top proponent of the HS-3 pickup) and his name isn’t even in the full list of players. Have Larry and Yng fallen out?